A recent report has shown that just 22 per cent of university professors across Scotland are female. The study, undertaken by the Scottish newspaper The Herald, also revealed that only 45 per cent of the total academic workforce are women. The number of female professorships has, however, increased from 2010-2011 when the figure stood at 18.3 per cent. Abertay University in Dundee has the lowest proportion of female professors, where just seven per cent are women. With 40 per cent, Queen Margaret University in Edinburgh has the highest ratio. The trend of low numbers of female professorships is not just restricted to Scotland. Across the UK, only one in five professors are women, according to The Times Higher Education. A similar study conducted by the Higher Education Statistics Agency (HESA) suggests that across the UK, the universities with lowest numbers of female professors tend to be the more research-intensive Russell Group institutions. According to further data collated by the HESA between 2011 and 2012, the number of female professors at The University of Edinburgh stood at just under 20 per cent, despite women making up just over two-fifths of the university’s academic workforce. Women are more likely to apply to enter university as undergraduates than men, with UCAS admissions data from 2014 showing that 58 per cent of applicants were female. In addition, there is an issue with inequality of pay between men and women at the universities. 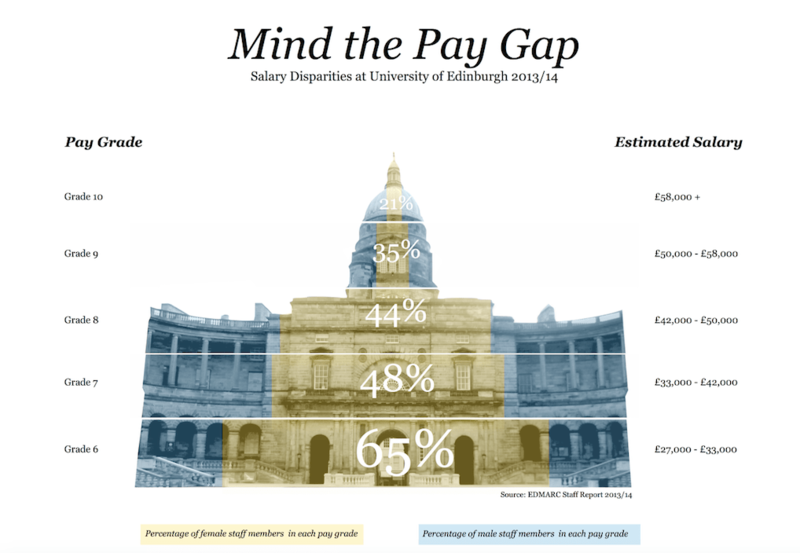 At a question and answer session with senior University of Edinburgh officials last Monday, Anne Richards, Vice Convener of The University of Edinburgh Court, responded to a question from The Student on the efforts being made to reduce the pay gap between men and women at the university. She said: “You should be in no doubt that both the Court, in terms of how it engages with management at the University, and management itself is completely focused with the challenge of dealing with the issues about this. “What we have to accept is you cannot change 500 plus years of history overnight. So I think I’m very confident in saying that we are making progress. And the data actually shows there is a lot of progress being made. But it is going to take a long time before we are anywhere close to parity. “The Court is very focused through the Renumeration Committee, through looking when we make an external appointment, when we go through the annual promotions, we ask for evidence about how a particular promotion, male or female, will affect the gender pay gap. Graphic courtesy of Ethan De Witt.